The TP-82: The Firearm of Choice for Space. The Outer Space Treaty dictates that no country will attempt to weaponize space, whether that be through the use of stationing weapons of mass destruction through to using it as an environment to test weapons. To me it’s probably one of the most forward thinking documents to have ever come about with regards to space as it wouldn’t take many in space incidents to make space travel, and by extension any purely scientific endeavours in space, completely infeasible. It also means that space is one of the few places where many nations agree and co-operate freely (although the USA vs China is the one notable exception) as there’s no arms race to be had. Of course space can still be used for military purposes but at least they’re not blowing each other up, further worsening our Kessler Syndrome. However the Outer Space Treaty doesn’t extend to weapons on a smaller scale, namely firearms or other weapons which could cause grievous bodily harm. I had heard a rumour that Russian space craft had long carried a small firearm along with them as their craft, which typically land on the ground rather than in the sea, had once ended up in a mountain range whereupon the crew was beset by wolves. Personally I didn’t think there was a whole lot of merit to that rumour as the capsules are kind of hard to miss and are easily retrieved by helicopter but apparently the Americans had made similar provisions, except they did not include a firearm. As it turns out the gun in question is quite real and flew in space up until as recently as 2006. It’s called the TP-82 (pictured above). On the surface it looks like an overgrown pistol with a long stock attached to the back of it. It’s actually a triple barrelled gun with each of them taking a different type of ammunition. Included in the kit is standard rifle rounds, presumably for taking out those wolves the Russians were so worried about, bird shot (I.E. standard shotgun shells) and flares. 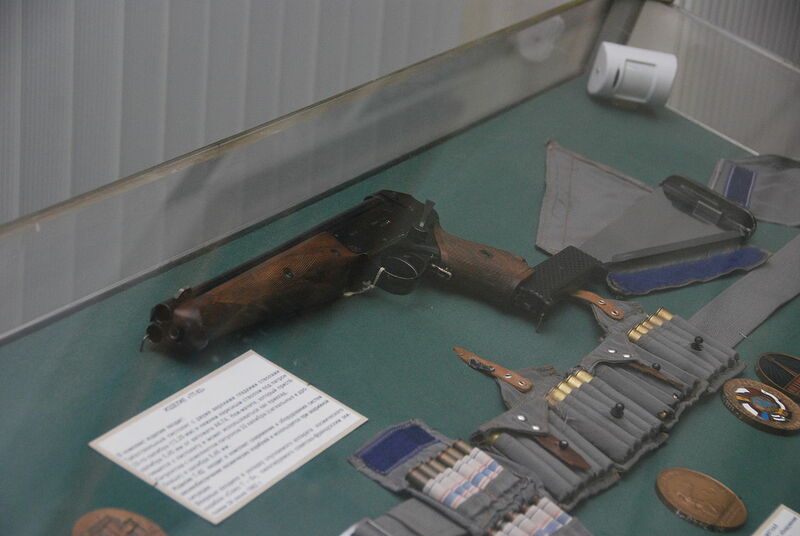 The stock was detachable and was actually a machete that had a canvas cover, enabling the returning astronauts and cosmonauts to hack their way through the forest if they happened to land in one. According to many reports it’s something of a decent firearm to use as anyone who’s sent up in a Soyuz capsule is trained in their use, even spaceflight participants. It seems however that the ammunition for these particular guns has been out of production for quite some time and the remaining reserves have long since expired. Multiple sources I’ve read said that since then the gun has been replaced by a standard Russian army side arm although it seems official sources are rather tight lipped as to whether or not that’s actually the case. Realistically there’s little reason for including them any more anyway so it’s just as likely that they just don’t bother. The TP-82 is an interesting part of space history both because of the reasons behind its creation and the fact that space is the last place that you’d want to bring a firearm along to. It seems like none of them ever saw any use outside of training missions and many of them ended up as gifts to the commanders of the Soyuz capsules once the mission was over. That’s probably for the best though as I can’t imagine the furore that would be kicked up if one was ever brought out in orbit, let alone if it was used on the ground. Russian Proton Rocket Crashes Shortly After Take Off. The Proton series of rockets are one of the longest running in the history of spaceflight. They made their debut back in 1965 when the first of them was used to launch the Proton series of scientific satellites which were super high energy cosmic particle detectors. Since then they’ve become the mainstay of the Russian space program being used for pretty much everything from communication satellites to launching the Soyuz and Progress crafts that service the International Space Station. In that time they’ve seen some 384 launches total making it one of the most successful launch platforms to date. However that number also includes 44 full and partial failures, including a few high profile ones that I blogged about a couple years back. To put this in perspective there’s been about 37 total launches of the Proton rocket since 2010 with 5 of them being either partial or full failures. This isn’t out of line with the current failure rate of the program which hovers around 11% but 4 of those have happened in the last 2 years which is cause for concern. The primary problem seems to be related to the upper stage as 3 of the recent 4 have been due to that failing which can be attributed to it being a revised component that only came into service recently. This particular crash however was not an upper stage failure as it happened long before that component could come online, indicating the problem is with the first stage. The reasoning behind why this crash ended so spectacularly is pretty interesting as it highlights some of the design differences between the American and Russian designs. Most American launchers have a launch termination system built into them for situations like this, allowing the ground crew to self destruct the rocket mid air should anything like this happen. Russian rockets don’t have such systems and prefer to simply shut down the engines when failures like this happen. However for the safety of the ground crew the engines won’t shut off prior to 42 seconds after launch which is why you see this particular rocket continuously firing right up until it tears itself apart. Additionally the Russian rockets use a rocket fuel mixture that consists of Unsymmetrical Dimethylhydrazine and Nitrogen Tetroxide. When these two compounds mix together they react in a highly energetic hypergolic reaction, meaning they burn without requiring any ignition source. This is where the giant orange fireball comes from as the aerodynamic stresses on the craft ruptured the fuel and oxidizer tanks, causing them to come into contact and ignite. Other rocket designs usually use liquid oxygen and kerosene which don’t automatically ignite and thus wouldn’t typically produce a fireball like that but the launch termination systems usually ensure that all the remaining fuel is consumed anyway. Needless to say this doesn’t reflect well on Russia’s launch capabilities but it should be taken in perspective. Whilst the recent failure rate is a cause for concern it has to be noted that the R-7, the rocket that launches both the Progress and Soyuz craft to the ISS, has experienced 0 failures in the same time frame with a very comparable number of launches. It’s quite likely that the failure isn’t part of a larger systemic issue since we’ve had multiple successful launches recently and I’m sure we’ll know the cause sooner rather than later. Hopefully Russia can get the issue resolved before too long and avoid such dramatic incidents in the future. A Successful Progress Launch, A Brighter Future for the ISS. It was just over 2 months ago when a Russian Progress craft crashed shortly after lift off. It was a devastating blow for the International Space Station project as the Progress spacecraft and the Proton rocket it rides to space on are the lifeline that keeps the ISS going. The failure of a Progress craft also called into question the man-rated Soyuz craft as they’re quite similar craft and should they be unable to launch that would effectively spell the end of human activities on the ISS. Investigations into the disaster continued and they finally nailed down the cause of the failure. The cause turned out to be contamination of the fuel lines in the Progress craft. This in turn caused a low fuel supply to the gas generator which the on board computer interpreted as a fault and shut down the engines completely. This left the craft on a sub-orbital trajectory eventually leading it to crash in the Atlai region in Russia. The investigation revealed that this particular fault was of no immediate threat to either the Progress or Soyuz craft however so Roscosmos saw no need to delay any of the following flights further than they already had. An unmanned Russian cargo ship launched toward the International Space Station Sunday (Oct. 30) packed with nearly three tons of supplies for the orbiting lab’s crew in what marked the first delivery run to the station since an August rocket crash. The cargo ship, called Progress 45, lifted off atop a Soyuz rocket at 6:11 a.m. EDT (1011 GMT) from a launch pad at the central Asian spaceport of Baikonur Cosmodrome. It will arrive at the space station early Wednesday. The successful launch of the Progress craft means that missions using the manned Soyuz craft can continue on without fear of them failing in the same way. This is crucial to the on going ISS mission as prior to this launch the future of the manned crews was in question and could have resulted in the ISS being unmanned for the first time in a decade. The reasoning behind this is simple, if the Progress and Soyuz are grounded then there’s no launch system that can take over their capability. Sure we have things like the JAXA HTV and the ESA ATV which are proven cargo delivery vehicles but they’ve both only launched once and neither could keep up with the rapid launch rate that the Progress offers. The Soyuz is the only means we currently have to get people onto the ISS and it being grounded would effectively end our ability to keep a human presence there. With the shakedown of the Progress complete and the mission looking to be a success it looks like we’ll be able to reinstate the full crew size of 6 in the ISS. Whilst the station can be run with only a crew of 3 (indeed it was for the majority of its life) there’s a lot more work that can be done when the crew is doubled, especially if EVAs are required. With the SpaceX Dragon demonstration missing rapidly approaching we’re not far off having another means with which to reach the ISS. As these recent events have shown having another launch capability is critical to ensuring that our missions in space can continue uninterrupted and hopefully we’re not too far off a time when there’s more than just 2 manned launch providers. Progress, Proton and The Future of the ISS. Russia’s space program has a reputation for sticking to ideas once they’ve got them right. Their Soyuz (pronounced sah-yooz) craft are a testament to this, having undergone 4 iterations since their initial inception but still sharing many of the base characteristics that were developed decades ago. The Soyuz family are also the longest serving series of spacecraft in history and with it only having 2 fatal accidents in that time they are well regarded as the safest spacecraft around. It’s no wonder then that 2 of the Soyuz capsules remain permanently docked to the International Space Station to serve as escape pods in the even of a catastrophe, a testament to the confidence the space industry has with them. The robotic Progress 44 cargo ship blasted off atop a Soyuz U rocket at 9 a.m. EDT (1300 GMT) from the central Asian spaceport of Baikonur Cosmodrome in Kazakhstan and was due to arrive at the space station on Friday. Now an unmanned spacecraft failing after launch wouldn’t be so much of a problem usually (apart from investigating why it happened) but the reason why this particular failure has everyone worried is the similarity between the human carrying Soyuz capsule and the Progress cargo craft that was on top of it. In essence they’re an identical craft with the Progress having a fuel pod instead of a crew capsule allowing it to refuel the ISS on orbit. A failure then with the Progress craft calls into question the Soyuz as well, especially when there’s been 2 launches so close to each other that have experienced problems. From a crew safety perspective however the Soyuz should still be considered a safe craft. If an event such as the one that happened this week had a Soyuz rather than a Progress on top of it the crew would have been safe thanks to the launch escape system that flies on top of all manned Soyuz capsules. When a launch abort event occurs these rockets fire and pull the capsule safely away from the rest of the launch stack and thanks to the Soyuz’s design it can then descend back to earth on its usual ballistic trajectory. It’s not the softest of landings however, but it’s easily survivable. The loss of cargo bound for the ISS does mean that some difficult decisions have to be made. Whilst they’re not exactly strapped for supplies at the moment (current estimates have them with a year of breathing room) the time required to do a full investigation into the failure does push other resupply and crew replacement missions back significantly. Russia currently has the only launch system capable of getting humans to and from the ISS and since they’re only a 3 person craft this presents the very real possibility that the ISS crew will be scaled back. Whilst I’m all aflutter for SpaceX their manned flights aren’t expected to come online until the middle of the decade and they’re the most advanced option at this point. If the problems with the Proton launch stack can be sorted expediently then the ISS may remain fully crewed, but only time will tell if this is the case. The Soyuz and Progress series have proven to be some of the most reliable spacecraft developed to date and I have every confidence that Russia will be able to overcome these problems as they have done so in the past. Incidents like this demonstrate how badly commercialization of rudimentary space activities is required, especially when one of the former space powers doesn’t seem that interested in space anymore. Thankfully the developing private space industry is more than up to the challenge and we’re only a few short years away from these sorts of problems boiling down to switching manufacturers, rather than curtailing our efforts in space completely. Call of Duty: Black Ops, Cinematic Gaming Redefined. There’s really only one thing that stops me from playing most of the Call of Duty series on the day of their release and that’s simply the price. Whilst the games will more than pay for themselves in terms of hours played vs hours worked to acquire them I’m still never happy shelling out $80+ for the game on Steam when it costs a whole lot less in another country. For Call of Duty: Black Ops then I simply waited long enough until it went on sale for half off before grabbing it which I was much happier to shell out, even if the overseas store also received it at half price. Still I had had enough people bugging me to get into this game ever since its release that I figured there had to be something good about it and strangely enough I’ve also been suckered into the multiplayer, something I usually avoid with these kinds of games. Call of Duty: Black Ops takes place during the cold war with the vast majority of the missions being recounted in flash backs by the main character, Alex Mason. At the beginning you awake in an interrogation room, strapped into a chair and wired to an electric shock device. Your captures then start questioning you about the location of a numbers station and attempt to jog your memory by running you through past events and occasionally jolting you. If I’m honest I really don’t like having stories retold in flash backs as too often its used as an easy way to patch together a plot that’s made up of otherwise incongruent elements. It’s still serviceable however and if we’re honest with ourselves here no one is buying this game based solely on the plot of the single player campaign. The cold war setting does make for some extremely interesting environments for the story to play out in. Whilst there’s no gratuitous space scenes like its predecessor there are an incredible amount of what I called “treat” scenes that just seemed to be in there to wow the player with eye candy and action hero style antics. The screenshot above is one of these such scenes where Mason is tasked with stopping the Soviet Union from launching Soyuz 1 and 2 with the mission culminating in shooting a prototype missile at the already launched craft. That’s not even the most ludicrous scene that plays out in Call of Duty: Black Ops but it was one of my most guilty pleasures in the game. The Call of Duty series has done extremely well with creating a game experience where you feel both like the hero and part of something much greater all at the same time. Whilst I’m not adversed to being the lone hero in games I’ve found myself enjoying games that make you feel like a part of a bigger picture. The first game to get this feeling just right was Freelancer where in one of the later missions you join up with a large fleet as part of the final series of missions. Black Ops manages to recreate this feeling consistently with you almost never being alone and in many cases being surrounded by your fellow men, powering forward towards your goal. The game play itself is nothing revolutionary but Treyarch have done their best to make sure that all of Black Ops isn’t just one long cover based shooter. Whilst you will be spending the vast majority of your time ducking in and out of cover in order to take out an inordinate amount of resistance there are several sections where you’ll be doing something out of the ordinary. Such things range from flinging explosives from hand made catapults to guiding soldiers on the ground from the cockpit of a SR-71 Blackbird. For the most part they’re welcome breaks from the almost constant combat that takes place but some proved to be more progression blockers than anything, especially if you missed the cue to do something out of the ordinary. One such event was a section of the Vietnam missions where you’re fighting your way down an embankment. The actual goal of this particular section was to kick barrels of napalm in order to clear out the section up ahead. However if you’re like me you would have thought that it was just another run and gun section so I instantly made a break for a machine gun nest so that I could cover the rest of my team mates. Doing so took me out of ear shot of my companion who was instructing me to kick the barrels and thus I spent about 30 mins wondering why the game would put in a section with practically unlimited enemies in it. I eventually came within earshot and figured it out, but it still felt like there should have been an on screen prompt for those like me who might have been a bit too keen to man the guns. Unlike it’s predecessor though I didn’t feel the same level of immersion with Call of Duty: Black Ops. I think this can be put down to the way the story was presented as each section stood pretty well on its own so that the breaks between them with the interviews felt like good places to stop if I felt even the slightest bit bored with it. Couple that with the epicness fatigue (I.E. after everything being so epic for so long you just don’t feel it anymore) you’ll undoubtedly suffer and the single player mission in Black Ops is best enjoyed in shorter bursts of 1~2 hours. That being said you’ll more than likely be done with the entire game in 5 sittings in doing that, so it’s not the worst thing in the world. Once the single player is over however many of Call of Duty: Black Ops’ players will spend many more hours in the multi-player, and rightly so. Realistically the single player of any Call of Duty game is the hook with which to draw people into multi as that’s where the player base spends the vast majority of its time. Coming into a multi-player game this late in it’s release was something I wasn’t looking forward to, thinking that I’d do a couple hours just for the review and then be done with it before I raged like I used to back in my Counter Strike days. Strangely enough though I found myself quite enjoying the multi-player experience, to the point of playing it for as long as I had played the single player. If you’ve played any Call of Duty (or any multi-player FPS for that matter) the game modes that are available in Black Ops will be familiar to you. Indeed not much about it differs from previous Call of Duty games with the persistent levels and ability to customize your class being the main hooks that keep people coming back. I knew this getting into it, figuring that I’d be slaughtered for the couple hours I dared touch multi. However even with an uncustomized class I found myself being quite competitive and it didn’t take me long to get the required levels to unlock some decent kit and create my own class. By the end I felt I was nigh unstoppable with my character being almost grenade proof, able to take out enemies both near and far and even topping the servers a few times. I still find myself going back for a round or two every so often when I’ve got some time spare, and I think I will keep doing so for a while to come. The question I keep asking myself is: was it worth missing out on this for so long just to save $40? Considering I had so many other games to play at the time I didn’t really miss playing Call of Duty: Black Ops but suffice to say those who were pestering me to play this game gave up long before I bought it and I haven’t seen one of them playing it since. Still despite that the game was very enjoyable and even managed to reverse my stance of not bothering with the multi-player in these kinds of games. In hindsight it would’ve been worth the cost of admission had I got it on day dot but I guess when principles and my wallet are both hit at the same time it’s enough to override my other impulses, no matter how strong they are. Call of Duty: Black Ops might not break any new gaming ground or try very hard at being original but it’s still a blast to play, especially when you play it online. It’s not often that a game makes it into my bag of titles that I’ll come back to when I just want to blow an hour or two on something fun but I feel like Black Ops will be there for a while now, at least until the next one comes out. So if you’re a long time fan of the Call of Duty series or just FPSs in general you won’t go wrong with Black Ops and even if you’re not there’s still a good 8 hours of single player to be had, more than enough for gamers in today’s market. Call of Duty: Black Ops is available right now on PC, Xbox360 and PlayStation 3 for $79, $68 and $68 respectively. Game was played on the second hardest difficulty setting with around 8 hours of total game time. Mutliplayer was played on multiple Australian servers with my most favored game mode being Team Deathmatch on Nuketown with around 6 hours of total play time and reaching level 18. Tickets to Space: The Price Just Doubled. You would think that with all the competition that is starting to appear for access to low earth orbit that prices would be falling through the floor, so to speak. Taking a quick look over what the going rate might be for say a Dragon capsule with a Falcon 9 underneath it you find yourself paying a cool $100 million or so and you can take yourself and 6 friends into LEO, or just shy of $17 million a pop. If we use that as a benchmark for the cheapest form of travel that is, as of yet, unproven then NASA’s previous costs of about $26 million per astronaut when using the Russian Soyuz craft seem quite reasonable. WASHINGTON – The price for American astronauts to hitch a ride on a Russian spaceship is going sky high. NASA on Tuesday signed a contract to pay $55.8 million per astronaut for six Americans to fly into space on Russian Soyuz capsules in 2013 and 2014. NASA needs to get rides on Russian rockets to the International Space Station because it plans to retire the space shuttle fleet later this year. NASA now pays half as much, about $26.3 million per astronaut, when it uses Russian ships. NASA spokesman John Yembrick said the cost is going up because Russia has to build more capsules for the extra flights. NASA had already agreed to pay as much as $51 million a seat for flights in 2011 and 2012, before the latest increase. Really it comes as little suprise that the price jumped significantly once NASA started asking for a serious number of seats. Soyuz spacecraft really aren’t that big (see here for a scale drawing vs the Shuttle, it could fit a couple Soyuz in its payload bay) and can only take 3 space faring humans at a time. Energia, the company that builds the Soyuz capsules and rockets, is currently producing 5 full launch systems a year which gives Russia 15 seats a year to play with. Considering NASA launches around 4~5 Shuttles per year with up to 7 astronauts in each you can see that if they’re planning to launch even half that many people on Russian crafts they’re going to need to build a fair few more launch systems to cope. It doesn’t really help that Energia will need to build some new infrastructure to increase their production capacity as their current 5 per year is pretty much the maximum they can build. This should put it into perspective just how much of a blow to the United States losing the Shuttle is. Whilst I can still appreciate some of the work they did (Ares V was set to be an absolute monster of a rocket) the launch gap they’ve put themselves into is incomprehensible. Many years ago when they began talks of retiring the Shuttle fleet there really wasn’t any alternative but to buy Russian rides and even then they knew that their capabilities can’t support both Russia and the US. Couple that with the fact that they could’ve spent some of the money they had for constellation on say man rating the ATLAS V (which Bigelow intends to do, but NASA rejected as it was too “high risk” to reach the deadline of 2011) they could’ve avoided this situation entirely. It doesn’t help that people keep throwing fuel on the fire by suggesting that the Shuttle be extended past its current end date. Sure it would help close the gap in launch capability but they would’ve had to had that extension in a couple years ago so that critical infrastructure, such as the external tank construction plants, wouldn’t have been shut down. Couple that with the fact that the Shuttle program costs $2.4 billion just to keep it alive (regardless of how many Shuttles are launched) you’re looking at huge costs that will net a very minimal benefit and will likely kill off many other projects due to NASA’s budget constraints. There’s really little sense in trying to revive something when you’ve already relegated yourself to letting it go. The huge cost of the Shuttle is nothing new either, but it would seem a lot better if the shuttle was used as it was designed to be. Despite its design by committee the Shuttle was designed to be launched often, up to 12 times a year (that’s 1 per month folks). If we were launching that often then the costs of the standing army would seem a lot more feasible as instead of some $400~$600 million costs you’d be much closer to $200 million, a sizable cut. That goal was never reached unfortunately although NASA did manage to get 9 launches done in 1985, which seems almost impossible now. It is really unfortunate that it’s too late to do much about the manned flight situation in the US, but there is hope on the horizon. With the Falcon 9 hopefully blasting into orbit sometime this or next month we’re not too far away from a private company resupplying the ISS, and from there its only a small step for astronauts to start hitching rides up there to. Maybe NASA needed to lose its capability in order to rethink what they’re doing, and hopefully they take this opportunity to do so.